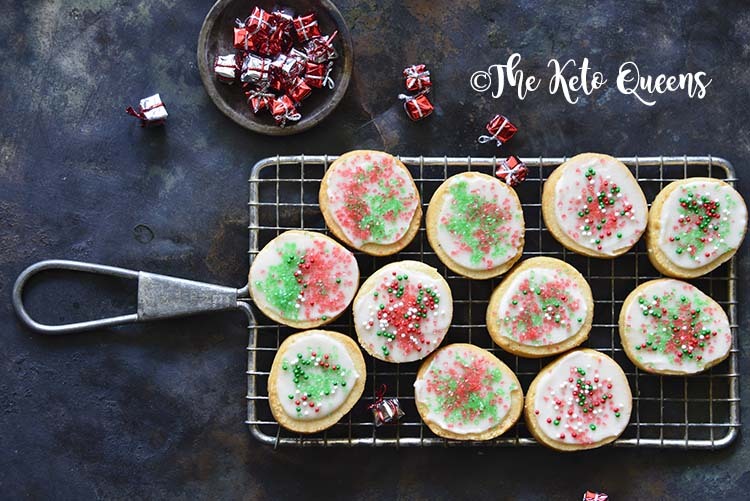 These Keto Christmas Sugar Cookies with Icing have crisp texture and classic buttery sugar cookie flavor, without the carbs. Whether it’s because of a favorite flavor combination or a classic we grew up eating, most of us have a favorite festive cookie. For a lot of us, sugar cookies are it! In addition to being delicious, they’re very versatile. You can frost them with a thick fluffy buttercream or ice them with a simple glaze. You can flavor them with any extract you like, such as coffee, almond, caramel, etc. Here we went for a classic pairing with vanilla flavor for the cookies and an icing that hardens into a pretty glaze. A great thing about this recipe for Keto Christmas Sugar Cookies with Icing is that you can roll out the dough and stamp out cut out cookies, or roll the dough into a log and slice it into slice-and-bake cookies. Sprinkles are optional, but they add to the overall festive look. And take note, this recipe is a good one to have on hand year-round; simply use different colored sprinkles to suit the season! 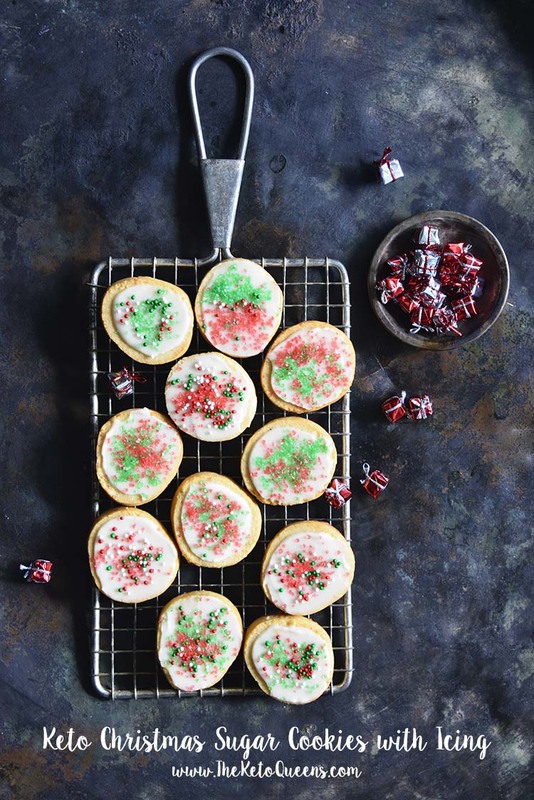 How Do You Make Cut Out Christmas Sugar Cookies That Keep Their Shape? Make sure the butter is at the right temperature. It should be at room temperature, not softened and not melted. Don’t use too much baking powder. In this recipe, we use just 1/2 teaspoon baking powder, which is perfect. If possible, it’s best to weigh the flour for this recipe. Be sure to chill your dough when the recipe says to! We chill it briefly before cutting or rolling out the cookies, and for a few minutes right before baking. Before baking, place the cookies on cool pans (not hot pans straight from the oven). Preheat your oven to the correct temperature before baking the cookies. How Far Ahead Can You Make Sugar Cookie Dough? A lot of people have asked us how long sugar cookie dough can be refrigerated. Sugar cookie dough is very forgiving in the sense that you can make it ahead of time and store it in the fridge or freezer until you want to bake the cookies. If wrapped well, the dough for sugar cookies will keep in the fridge for up to five days, or in the freezer for up to three months. How Thick Do You Roll Out Sugar Cookies? We’ve experimented a lot with cookies of different thickness, and we’ve found that rolling out sugar cookie dough to a thickness of 1/4-inch works best. What Are Slice and Bake Cookies? Slice and bake cookies are cookies that are sliced from a log of cookie dough. The cookie dough is made and then rolled into a log, briefly chilled, and then sliced into rounds. 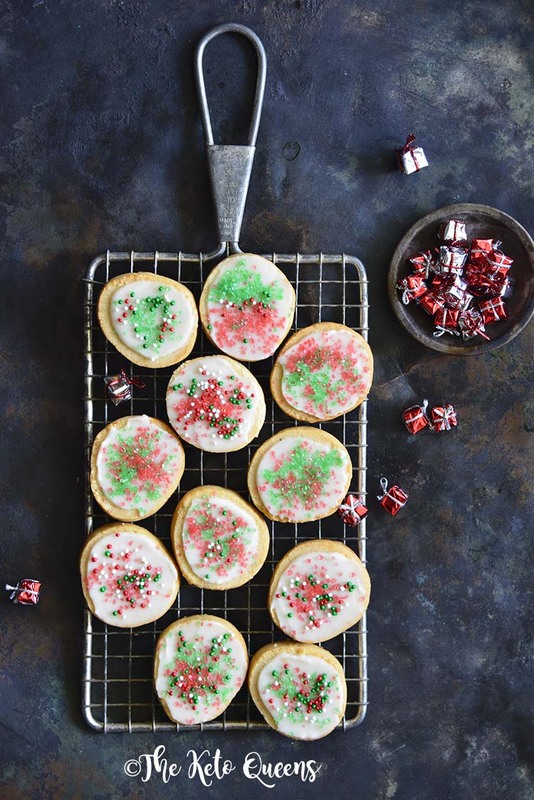 One of the best things about our recipe for Keto Christmas Sugar Cookies with Icing is that you can make either slice and bake cookies or cut out cookies with it. Wrap the dough log well with plastic wrap, place it in a zip-top plastic bag, and squeeze out all the air. If you want another layer of protection to keep the cookie dough from absorbing other flavors and/or aromas from the freezer, first wrap it in parchment paper, and then in plastic wrap, and then place it in a zip-top plastic bag. Thaw the dough at room temperature for 10 to 15 minutes before slicing and baking. 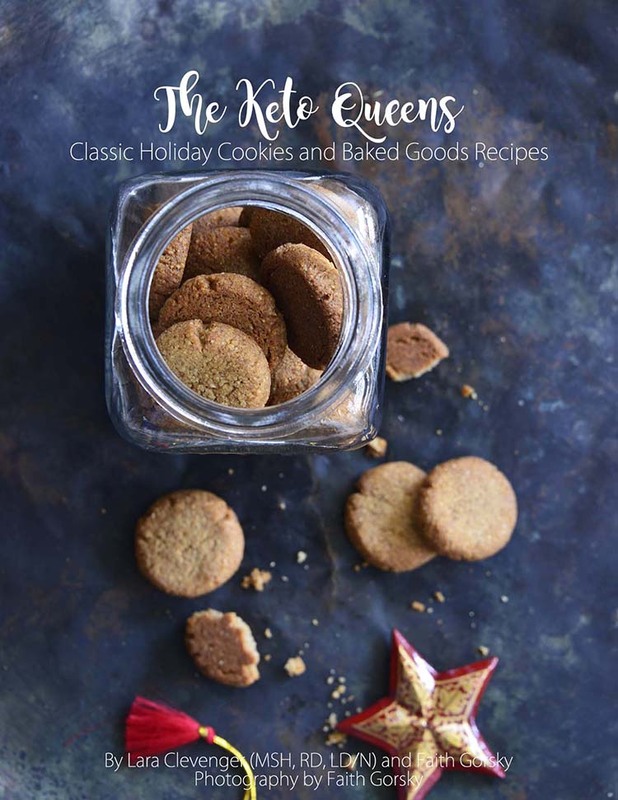 Get more keto holiday cookie recipes in our Holiday Baking Recipes e-book! 3/4 teaspoon additional extract e.g., pistachio, hazelnut, almond, etc. Preheat the oven to 300F; line a large baking sheet with parchment paper or a silpat liner. Cream together the butter and cream cheese in a large bowl, and then cream in the vanilla, additional extract, and Swerve. Mix in the almond flour, arrowroot, baking powder, and salt until it forms a dough. For slice and bake cookies, roll the dough into a 6-inch log, wrap it in plastic wrap, and chill until cold (about 30 minutes in the fridge or 10 minutes in the freezer) before slicing into 12 rounds (each 1/4-inch thick). For cutout shapes, form the dough into a disk, wrap it in plastic wrap, and chill until cold. Roll it out between 2 sheets of parchment paper to a circle about 10 inches in diameter and 1/4-inch thick. Use any festive cookie cutter shape to stamp out cookies. Arrange the cookies on the prepared baking sheet; chill 10 minutes in the freezer. Bake until golden on the bottom and along the outside, about 20 to 24 minutes. Cool completely before removing and glazing. For the glaze, whisk together all ingredients, adding just enough water so it reaches a glaze-like consistency. Spread the glaze on each cookie and let it set before serving. Arrowroot starch is a no-go for keto. What can be used in its place? Xantham gum? Jason, We don’t consider any foods “bad” foods or off limits; instead, we focus on foods that fit into our macros, are as nourishing as possible, and help us avoid eating a less healthy alternative (that’s where these sugar cookies come in). We try to opt for less processed, “real” foods whenever possible. Xanthan gum may work in place of the arrowroot here, but we haven’t tried it; we don’t use xanthan because it causes GI distress in a lot of people, unfortunately, us included. If you try this recipe using xanthan or something else, please let us know how it goes!